If you're heading to Madrid and looking for somewhere to stay that's central, budget friendly and pretty quirky then Praktik Metropol needs to be at the top of your list. Located on Gran Via (the oxford road of Madrid) you literally can't find a more central base for your exploring. The entrance to the building is nestled between a tapas restaurant and the fanciest McDonalds ever seen (have you ever seen marble staircases and a huge glass cake counter in a McDonald's before?) and you could easily miss it if you're not specifically looking out for it. The building is very typical for Spanish architecture which has been beautifully restored both inside and out that happens to be home to three hostels along with Praktik Metropol. It's easy to say that Praktik got the best deal of the floors with having their lobby and communal area on the 1st floor and then bedrooms on the 2nd, 3rd, 4th and 9th floor complete with rooftop terrace. The interior styling is minimalist scandi inspired and wouldn't look out of place in a copy of Elle Decor. 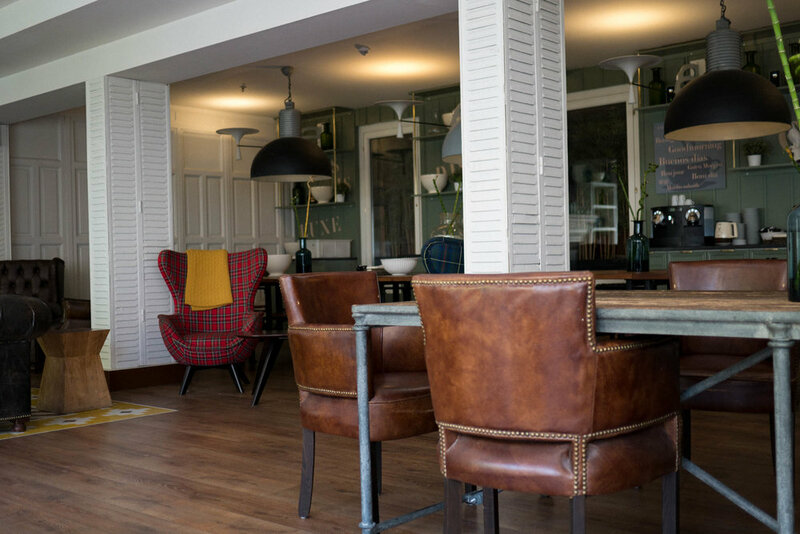 The open plan lobby and communal area are complete with wing back chairs, chesterfield sofas and a huge wooden dining table, the perfect area to grab a coffee from the machine, catch up on emails or just people watch fro, the huge windows that look over the bustling high street. The bedrooms are smaller than the average hotels but the sleek monochrome styling and the location more than makes up for this. The combination of chic mosaic bathroom tiles, giant king size bed, antique style window shutters and waterfall shower definitely do not resonate with the budget price tag and they could easily be charging a good 50% extra for their rooms without a grumble from any guest. The best bit of the hotel has to be the breathtaking 360º panoramic roof top terrace which takes over two levels giving you the most unrivalled views of Madrid's skyline. There's plenty of sun loungers and table & chair sets so you can catch some rays or relax with a game of cards. As the hotel doesn't have its own bar or restaurant Praktik invites you to bring in your own food and drink meaning you can enjoy a sunset rooftop beer for less than a Euro if you head over to the supermarket which is less than 30 metres away.